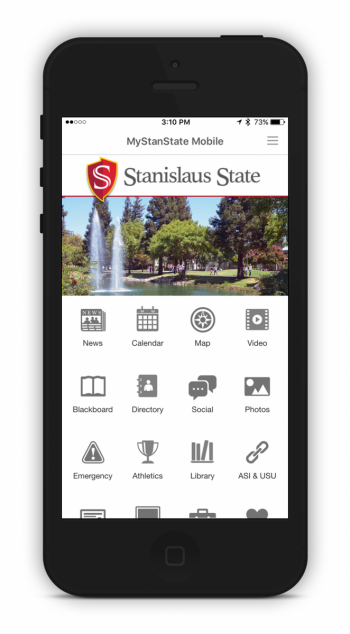 Use the Stanislaus State app to find information, read campus news, keep up with Warrior Athletics and find out what's happening around campus. Change the view of the app based on which campus you are on. Locations for the Turlock main campus, and the Stockton campus. GPS location will ask you to switch locations, or you can manually change it from the menu. Change the Persona of the App based on your affiliation with the University. Views for Students, Staff/Faculty, Alumni, and Guests of the University. Change the persona from the menu. Get the big picture — read interesting articles, media releases, news and more. View various campus calendars to stay up to date with campus events. Find your way around campus and get directions to Stanislaus State. Students can access their Blackboard classes, assignments, and announcements. Search for Faculty and Staff using the Directory lookup tool. Stay in touch with Stan State via our Facebook and Twitter feeds. View pictures of our beautiful campus. Stay up to date with our Warrior Athletes at Stanislaus State. Get more information about the University Library. Learn about student government and catch up on programming and events. For Current Students only - Students can view grades, search for Classes. Current Students have the ability to Search for Classes and Add/Drop classes during registration. Report a Facilities Problem on campus, a Technical Problem, or report a non-emergency crime. View Health information from our Student Health Center. View Chartwells OnCampus Dining app for menu's and hours of operation. Many other features coming soon. Check back here for updates. For issues or questions with the mobile app, please contact the Technology Support Desk.